Euhedral arsenopyrite (white, high reflectance, left) is intergrown with galena (light blue-white with triangular cleavage pits, centre), chalcopyrite (yellow, centre) and sphalerite (light grey, centre right), with fine chalcopyrite inclusions (top left) or submicroscopic chalcopyrite (grey to brown-grey, centre right). A lath of poorly polished molybdenite (light grey, centre) is enclosed within chalcopyrite and galena and mother has partially rimmed arsenopyrite (bottom right). 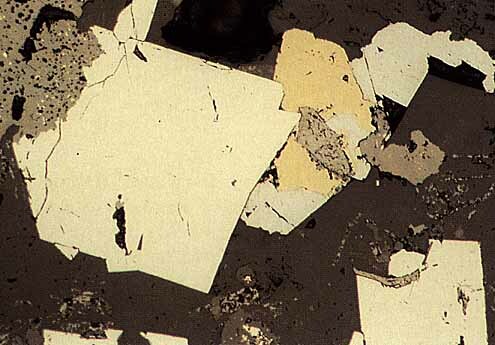 Minor amounts of rutile (light grey) form acicular crystals within the gangue (right centre). Black areas are polishing pits.